Well, for many decades the past sports teams of the Hopland Elementary and Hopland High Schools were referred to as "The Hopland Bears". Ironically, back in those days real black bears were scarce around Hopland, the Sanel Valley, and the rest of southeast Mendocino County. A reappearance of American Black Bears (Ursus americanus) has occurred during the last 30 years or so, with signs of bears becoming more common during the 1980s and 1990s. In the recent decade, especially the last four years, evidence points towards black bears as now being permanent residents within the chaparral and oak woodland communities at the higher elevations of the UC Hopland Research & Extension Center. 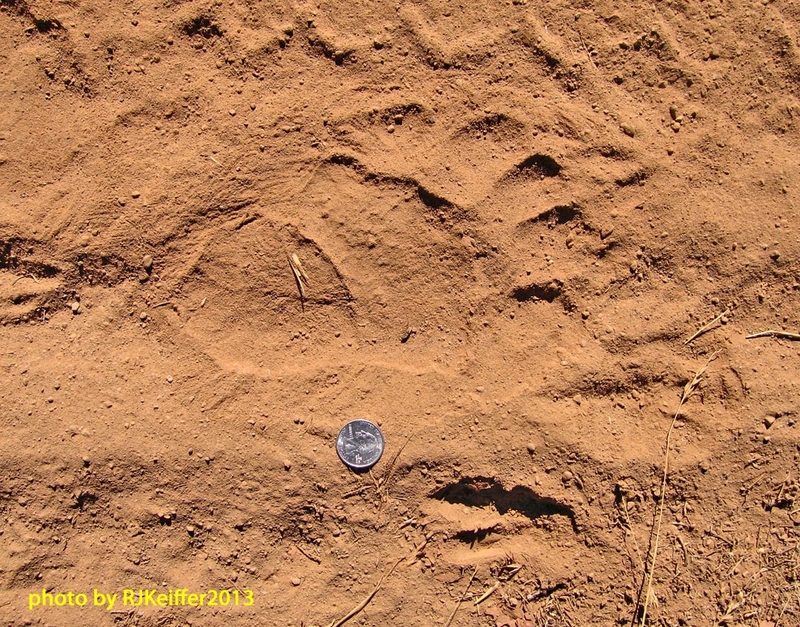 Here you see a fresh hind-foot track of a mature bear that I found this day just about smack-dab in the middle of HREC. The coin is a quarter dollar (about 1") for reference. Oh ... that's a deer track at the bottom.